The Books for Walls Project: Goodbye, Dear Jean Craighead George --we'll miss you, thank you for leaving us so many books! Goodbye, Dear Jean Craighead George --we'll miss you, thank you for leaving us so many books! 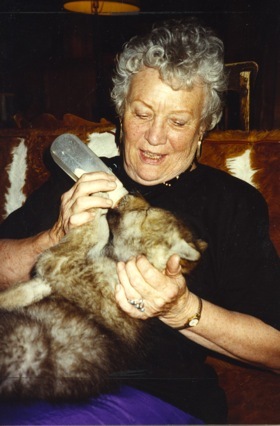 Jean feeding a wolf pup. This letter will be brief since we imagine you busy with your animals. Did you know that in our house --that is tucked in the middle of the woods-- we couldn't survive without you? Over the years we've read and then researched so many things, ALL BECAUSE OF YOU. Many people ask us our very favorite books; we agree with Neil Gaiman who said, "picking five favorite books is like picking the five body parts you'd most like not to lose." Jean we pick your books; they are like body parts. Thank you. Jean, we will miss you. -or perhaps write her a letter too! oh i didn't hear that! i am so sad. her books have definitely influenced millions (including myself).